I like to start with my bed! For the longest time I’ve dreamed of having bedding that reflects the Christmas season. A couple years ago I found a beautiful quilt and shams on sale and grabbed them up! 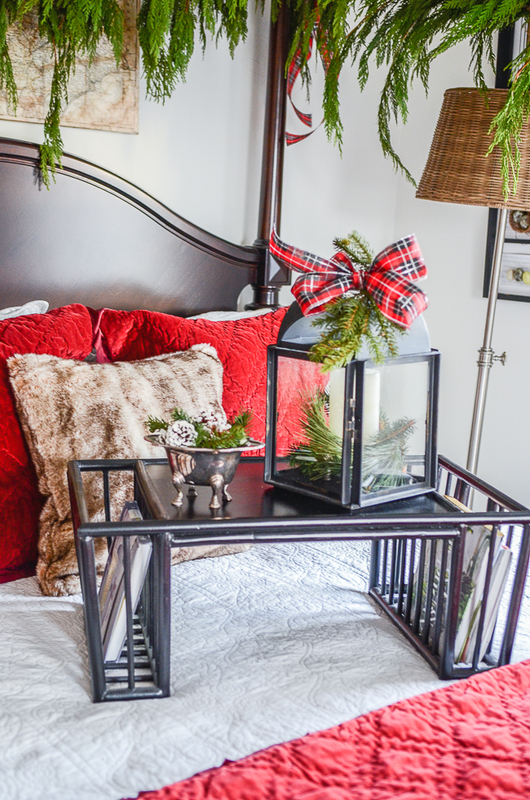 Look for bedding that you can use all holiday season or even on different beds. 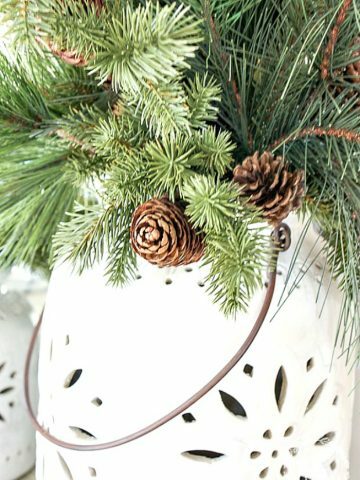 Choosing a solid Christmas color will give a hint to the season but won’t scream CHRISTMAS and could be used all winter long! The same with pillows. I chose faux fur pillows to go with the red velvet pillow shams. I can use them in any other room all winter! I also love decorating my bed with greens. This bedroom has a four poster bed so I strung a garland of cedar around the bed. 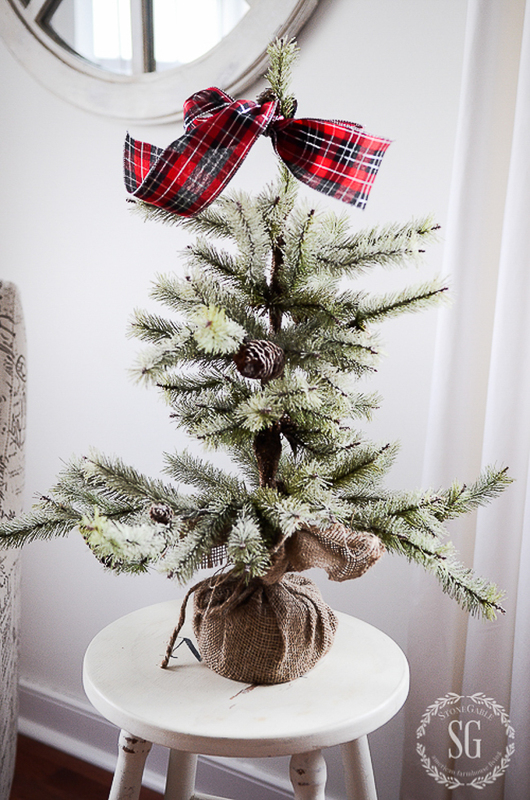 The garland was attached to the post with a pretty plaid ribbon. Even if you don’t have a four poster bed to hang garland why not put a tad of greenery somewhere on or near your bed. And speaking of a little arrangement, I added one to the table in the guest room. The red berries work with the red bedding! I have a clear plastic box filled with all kinds of berries I’ve collected over the years! And don’t you love this little footed silver dish? Perfect for a few greens! This bedroom holds a family treasure. The only thing I have from my father’s side of the family is this white ironstone plate. I embellished it with a preserved boxwood wreath. 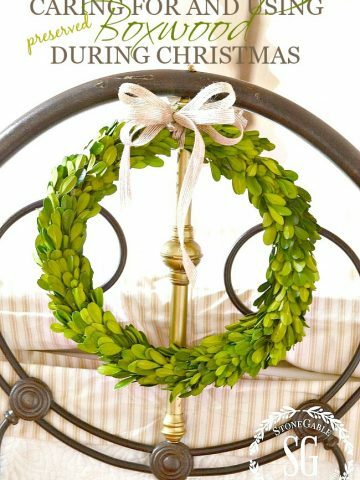 Think about adding a little wreath to a mirror or picture or art you have hanging in your bedrooms. Better yet, hang little wreaths from coordinating ribbon from the inside of each window. So so pretty! Every bedroom deserves a tree. I have a little tree that I keep in the guest room closet and pull out every year. It’s a bit of a Charlie Brown, tree but aren’t they darling? No baubles or balls… just a ribbon at the top. I am a huge fan of bed trays. They are prime real estate to decorate! 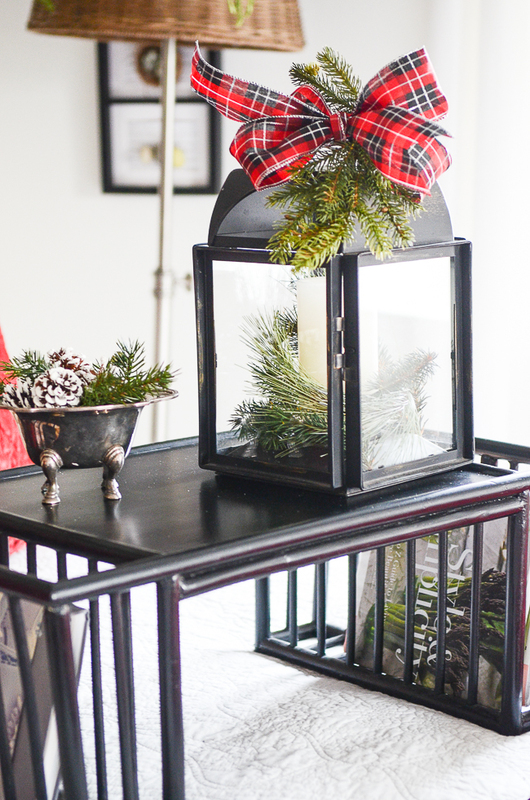 I added a festive lantern to the bed tray. When guest use this room I put the lantern by their door. It’s so pretty to see the glow of a candle to lead them to their room! I use a battery operated candle with a timer, of course! 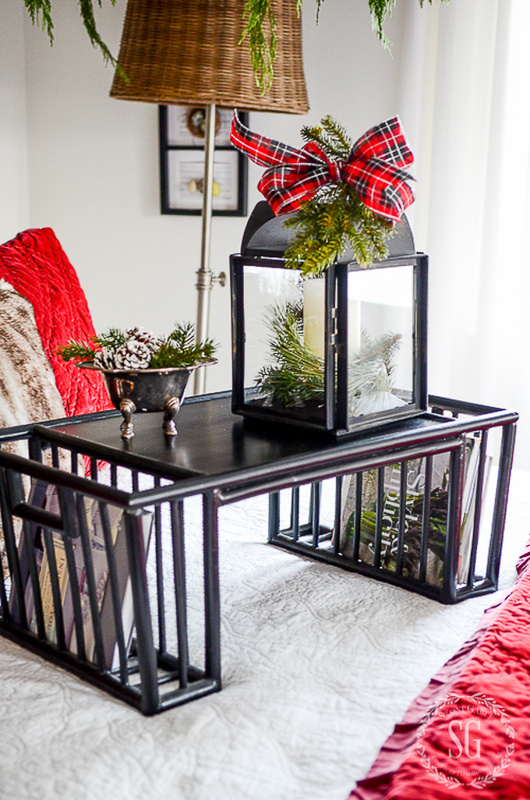 You don’t have to do a lot to bring Christmas to all your bedrooms. 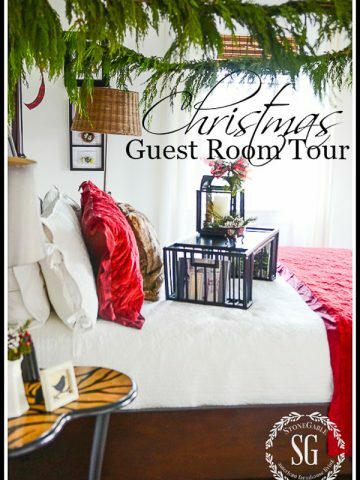 Just a little nod to the season in each room will make it feel special and Ho Ho Ho-liday!!!! 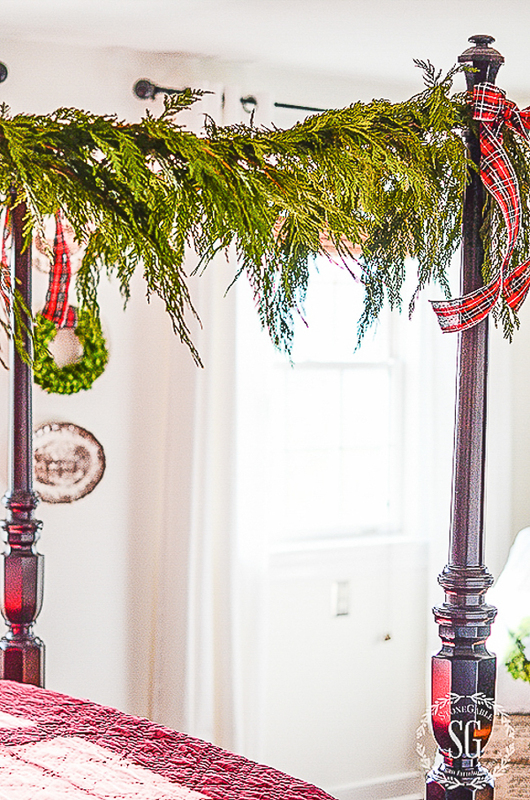 The garland on the four poster bed just made me swoon! Fidle me dee! The red blanket at the foot of the bed and the bows where icing on the cake. Love it! I want a four poster bed just to decorate for Christmas. Love, love your red quilt& pillow sham!! 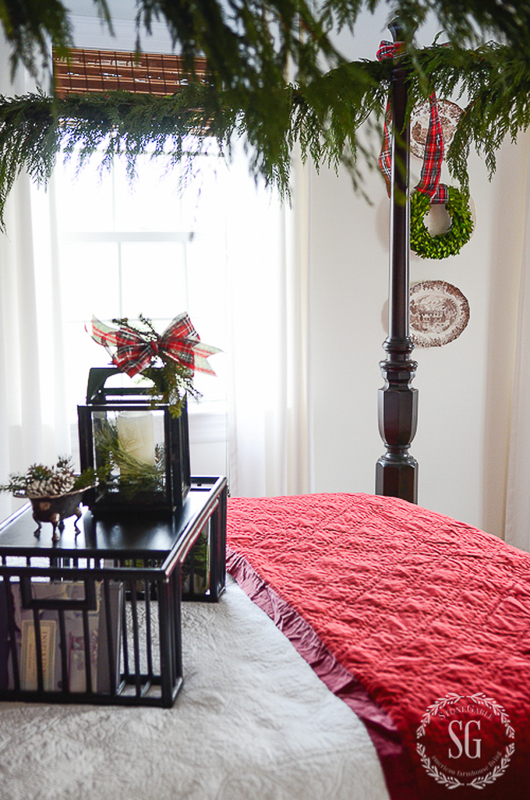 My guest bedroom’s winter quilt has red in it with a red checkered dust ruffle. Thanks for the little ideas that mean a lot to guests. Merry Christmas! Thank you for this post. The bedroom is always difficult for me to decorate because there is not much extra space. I love your ideas for bedding that is not strictly limited to Christmas. Many of your suggestions are doable and I love that. 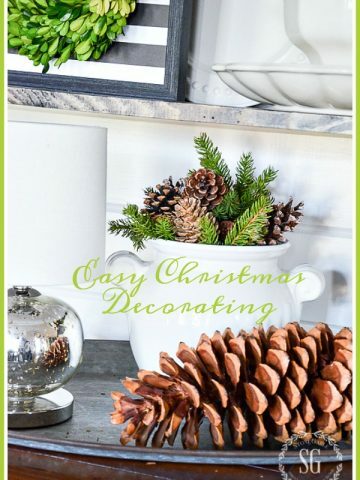 for any season.I lo ve Christmas decor..
Next Christmas I am going to have a house full. My children both live in distant states so I don’t often get them at the same time but I I have put in a request (they say a demand ) for everyone to get together. Now, for the first time in a while, I am going to decorate the whole house and I am definitely going to use your ideas liberally. I know that it seems strange to be talking about the coming year instead of this one but for the first time in years, I want to decorate all thru the house. Thank you for some great ideas. Merry Christmas and Happy New Year. Oh how nice Gloria. May I step in and give you a little advice? Start decorating EARLY!!!!! You want to be fresh and enjoy your company! I love the red, green, black and white color combination. 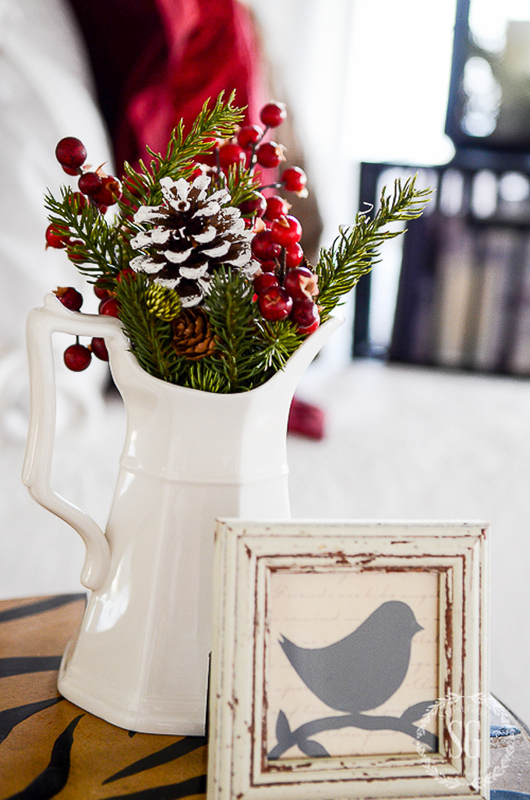 Neutral backgrounds are great because you can add pops of color to reflect the season. Beautiful! W O W! I have always wanted to decorate my bedroom, think after Christmas I’ll be shopping for a small tree ,this blog post is very inspiring. I also have a thing for ribbons they sure can add a festive touch. Lovely Christmas bedroom. I particularly like the bed tray. I thought about putting garland around my bed canopy but was worried that I would end up with dropping greenery in the bed. 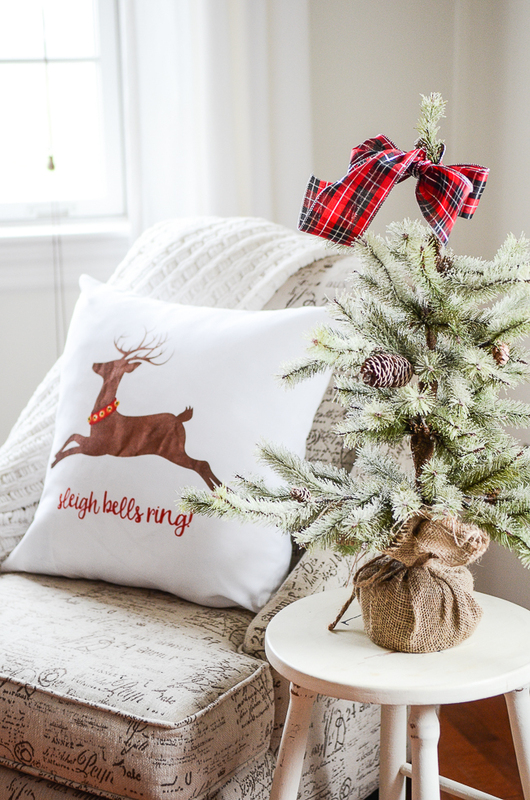 The fresh garland looks fabulous, and I love the little tree and reindeer pillow. Merry Christmas to you! Oh I love all your ideas for the bedroom! I am definitely keeping everything in mind….I have added Christmas to every room but our master bedroom…I do have a red paisley duvet cover, I have to think on how I would decorate our room, the walls are deep persimmon (believe me with all the pillows it goes well)we have Verdigris iron bed and a eclectic group of furniture…I am thinking on how we can add Christmas to this room, its small and we live in a small coastal cottage…I always enjoy your posts! I too have an iron bed in my master that has a Verdi Gris finish. I used a faux garland on the headboard intertwined in the posts. It is a small one so it’s not overdone. We also live on the water and I traded in my beautiful four poster for something better suited to our lake house. I always use white/off white on my bed with a sage green dust ruffle. My drapes (repurposed from our previous house) are a woodsy print with green, shades of beige and burgundy that I coupled with sage green drapes as we have two walls of windows which required large width curtains. I added a burgundy beaded pillow to the white ones and have sage green linens on the bed. I use a deep red throw at the foot of my bed. I also have two large angels done up in the same colors one each suspended from the center of the curtain rod. I also use a Christmas tree skirt that I found with a reindeer done up in the sage green/brown that I put on my bedside table as a topper over a sage green tablecloth. The angels and this topper are the only things that need to be removed after the holidays. Then I keep this until spring when I change out linens and throw pillows. I use a some green garland with white tips that I put tiny white lights on. In the center I have a light weight white star with silver glitter around the edge. I drape this on our headboard which is a very tall white wooden headboard but I’m sure the same idea would be lovely on your iron bed. I use a thin white ribbon to tie the garland to each side of the bed. I get so many complements on how it looks when friends see it. It’s simple but pretty and festive. Your coastal cottage sounds lovely. I was thrilled two years ago to find a deeper red bedspread, with two pillow shams, with large white snowflakes. I use it on the bed all winter. I also use specific pillows, in my case, a larger than average “fuzzy” white pillow as well as two off white throw pillows that have silver snowflakes. I love having something more seasonal, and it’s so nice to have something that breaks up monotony of the daily look of the room. As always, love your style, and the great pics! I have a small 3 bdrm duplex and love decorating every room! A touch here and there goes a long way. In my bedroom I have a white tree and I used pink and silver to decorate! It is so soft and pretty. Other rooms I love the traditional red, green and white! What a beautiful, elegant, and yet, oh so simple way to decorate. I love your little touches, and I think I might add a lantern to our master bedroom. It looks so welcoming! Thanks for sharing! gah….this is all so gorgeous, friend. 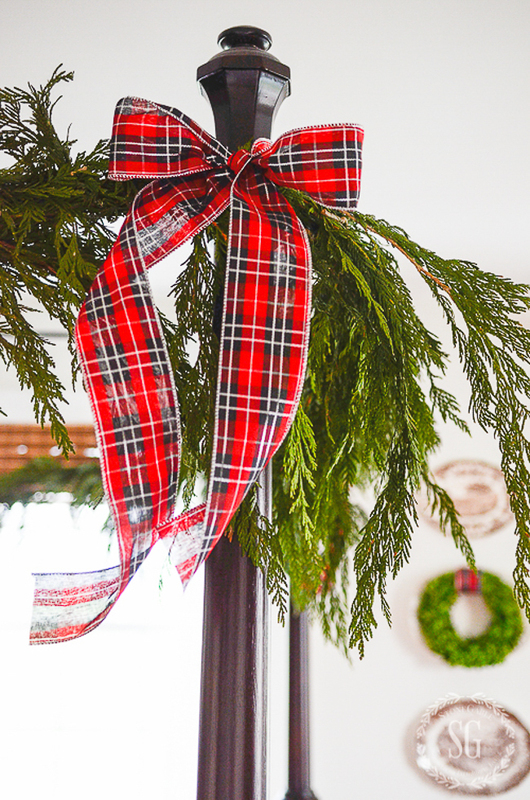 The cedar garland is a show stopper. 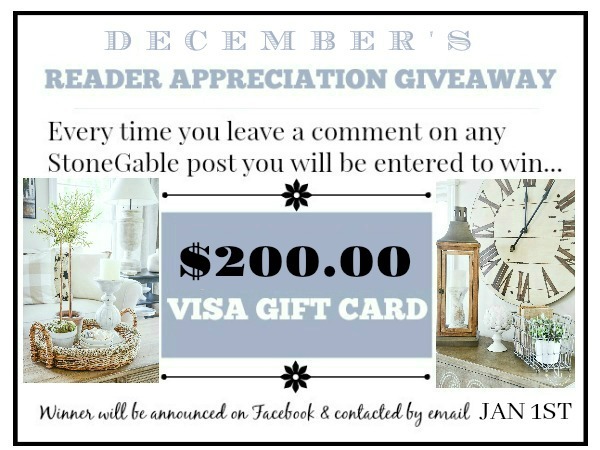 Glad I am able to read and post again, and you did not disappoint!! Live your posts Yvonne!!! This post is new. I just used pictures I had before. This is what inspired me to decorate my bedroom at Christmas. I had never considered it until I saw this post. Thanks for the inspiration! Everything looks so beautiful and Christmasy! I put a little in each rom, but my guest room gets a full tree. So festive! Your bedroom looks so pretty! I have a little tree in mine. How beautiful! Thank you. I’m going to decorate my bedroom today! Oh, yea!!! I’d love to see a picture! I look so forward to viewing all your beautiful decorating ideas that you use in decorating your home. Your home is so inviting and it makes a person want to come back and stay awhile. Thank you for taking the time in sharing your talent and your love for the Lord. How nice of you to say, Keela! 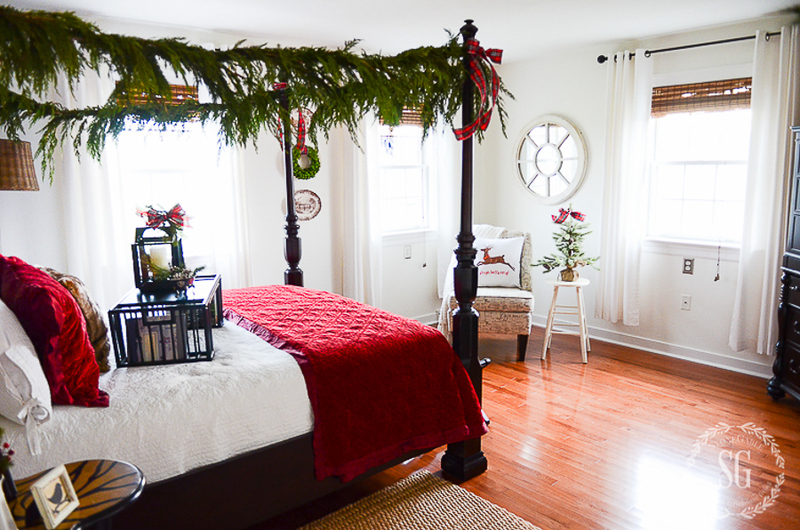 Oh the garland strung above the bed is divine!! Love it!! ? Next year I’m getting faux. I think I’ll do this every year! I LOVE the little Charlie Brown tree! just lovely …simple , warm and cozy! 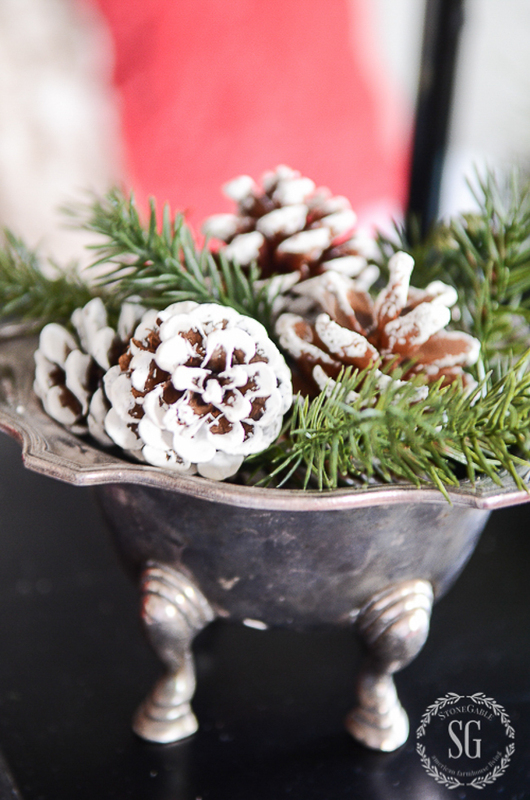 you only need a small touch like some greens or a wreath to make it festive. I put the cutest little faux tree in each guest bedroom. I’m going to take your lead and add a little greenery to each headboard. It really does add an old world festive charm. You give us the best advice Yvonne. I don’t believe there is another blog out there so chocked full of info and tid bits. Thank you! THANKS so much Joanna! I try to give lots of ideas in each post. So glad you noticed. Your bedroom is lovely! I would love to have a bed like that in my master. Have a wonderful Christmas Season! Just lovely. Would you please share your source (or method) for the preserved boxwood wreath. I think a trip to Lancaster needs to be on my to do list. Hi Mary, see my comment to Janet. So inviting! I would love to spend the night here. Love the idea of the pillows and the use them somewhere else. This looks so festive- but not too much. 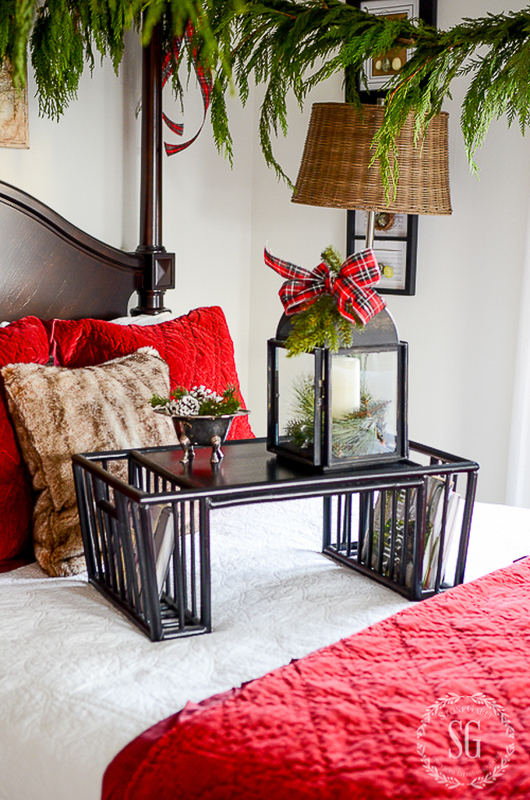 A very festive guest room. I added a small prelit tree with a timer to each bedroom. I purchased a small gray pillow from PB with words in white: And to All a Good Night. It’s part of our bed’s assorted Christmas pillow collection. I visited your favorite store to buy greens. How absolutely lovely and inviting! I’d love to come & stay! Beautiful Yvonne!! We have a Garden center across the road from my house. It came from there. I never thought about decorating my bedroom for Christmas, but I love what you’ve done with yours! Thanks for the great ideas! 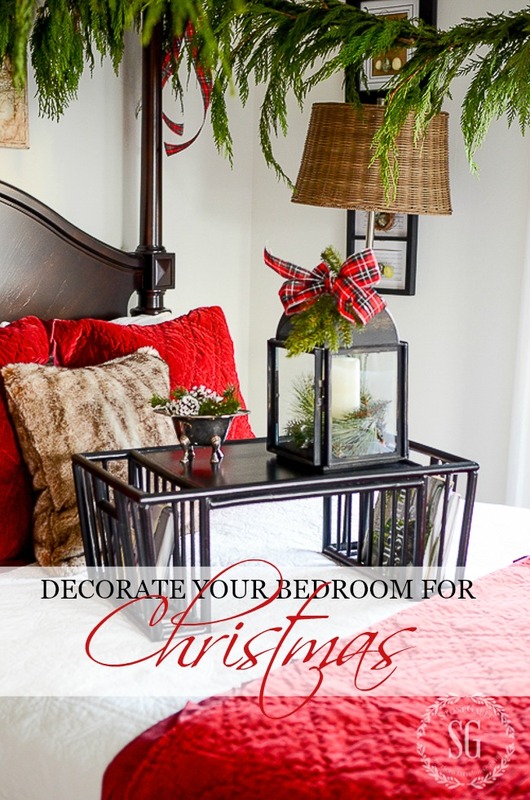 So many great – and easy – ideas to spread a little Christmas in the bedroom. Thanks for the great inspiration! Yvonne, the bedroom is beautiful, warm, and welcoming! My very favorite item is the plate you spoke of so fondly. I love that you have a treasure from your dad’s family. They are truly priceless and mean the very most! 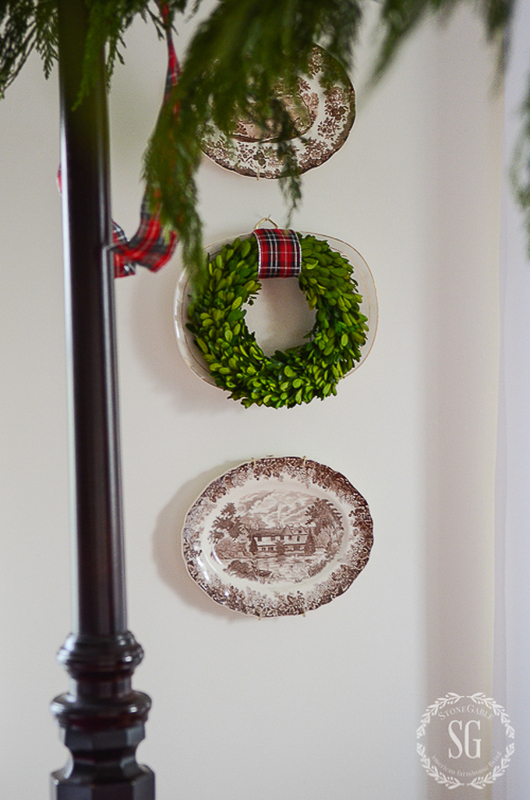 The small boxwood wreath is a perfect accent! Merry Christmas. Yes, that little plate is a true treasure to me! So simple and pretty! Most of my family is coming to New England for Christmas so I’m trying to put a little Christmas everywhere…in the bedrooms, even the bathroom has a Christmas shower curtain, towels and other decor. I love seeing Christmas in every room! Thanks for all the tips…love your blog 🙂 Merry Christmas to you and your family! Beautiful beautiful bedroom Yvonne!….Now where is your reservation book!!! Have a Very Merry Weekend! You don’t need a reservation dear friend. Just come! Your bed room looks so cozy and festive. It would be so comfortable for a nap or a long night.